It's been an epic week. Alliances, spies, emo meltdowns, excuses and accusations, commanders who never sleep and best of all action that matters all day, every day. 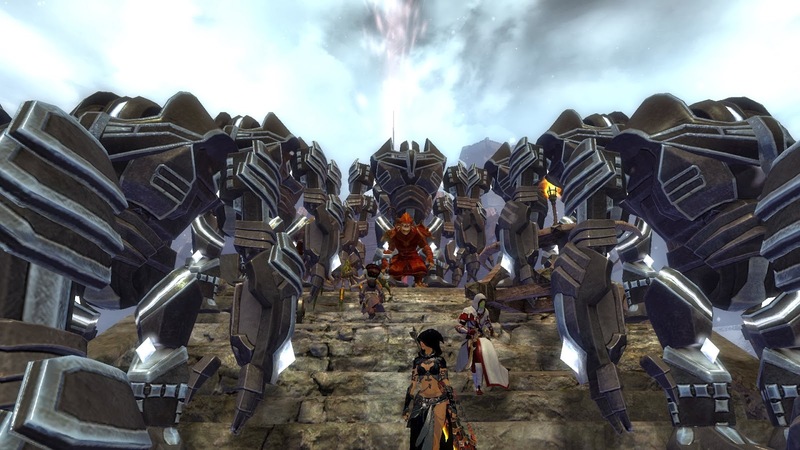 This was the week we saw WvW as it can be and, in my opinion, as it should be. Alliances were the big theme of the week. Should they happen? Are they allowed? Do they break the Rules of Conduct or are they Working As Intended? The arguments raged all week across the thirty-page threadnought that dominated last week's GW2 Match-up Forum. Not surprisingly, most of the naysayers were on the server being allied against but there was a strong element of denial from the Allies themselves, many of whom were at some pains to deny there was an Alliance at all. As far as I can gather, not being privy to the High Councils of War on either Yak's Bend or Ehmry Bay, there was some discussion between a handful of guilds on each server prior to the match on the possibility of working in tandem to stem the tide of Stormbluff Isle's inexorable progress but no formal agreement was made. Come reset night there was a general rush of blood to the head and thoughts of alliances were largely forgotten. In the first few days I can attest that there was very little open discussion of co-operation with Ehmry Bay. I didn't see a lot of evidence that we were timing our attacks to co-ordinate with theirs. Rather, both we and they had the same objective: don't let SBI have any of our stuff, take all of theirs. Ehmry Bay bunkered down in their borderland, picking targets of opportunity as and where they could find them and for whatever reason SBI chose to leave them alone and concentrate their forces elsewhere. That was possibly their greatest tactical mistake. As I reported earlier, Yaks burned hard for the entire weekend from reset onwards, taking and holding an unexpected lead, while EBay's watchful patience and SBI's obsession with Stonemist Castle saw the supposed strongest server pushed into third place. It seemed too good to last and it was. By Monday afternoon normality seemed to be re-asserting itself. As predicted the coming of the working week put a crimp in YB's ability to do much more than defend one map at a time, while SBI's stronger Oceanic timezone population saw them chewing through the points buffer we'd built up across the weekend. Ehmry Bay were shoved aside into third place as SBI came after us, snarling. One of the most tense periods of the week saw one of our best Commanders staying on long after he should have taken a break while another sulked in his tent like Achilles, brooding on the loss of territory and the undoing of all his efforts of the long night past. Our long-suffering, unfed, un-rested leader tried several times to pass the baton to other Commanders but everyone had their hands firmly behind their backs so on he went, heroically and increasingly hysterically. In the end Achilles returned to the field, where he remained, seemingly sleepless, for the entirety of the rest of the match. By Tuesday things were beginning to look bleak. We still held the lead but the SBI dogs were snapping at our heels. Then came the spies. I was in Shadaran Hills on Stormbluff's Borderland, a keep we'd held since soon after reset, when the first spy was spotted, grabbing our vital supply by the armful and using it to build ballistas in a tunnel under the keep where they could serve no useful function. From there things escalated from espionage to blatant cheating and the whole tenor of the competition changed. It's claimed by some, Mrs Bhagpuss among them, that the bad sportsmanship, carried out though it almost certainly was by only a tiny and unrepresentative segment of our enemy's population, had the immediate effect of galvanizing the wider Yak's Bend population in a determination to kick the crap out of SBI. If our previous supposed animosity towards them had been largely on the level of hissing a pantomime villain, suddenly it had crystallized into a very real anger. You can never have too many golems - traditional Yak's Bend saying. Least said about the copycat retaliation the better, I think. I'm all in favor of genuine espionage (Ash Legion, me...) and I believe sneaky tactics like making characters on other servers and infiltrating TeamSpeak channels to relay back intel all adds to the excitement and tension. Being able to destroy golems and deplete supply openly with total impunity, however, isn't spying, it's exploiting loopholes in game design and should be dealt with accordingly by the authorities prior to those loopholes being closed. All of these, of course, if they meant anything at all meant the same to all the servers involved. Bethesda's Beta invites didn't go out exclusively to key guilds on one GW2 server and no other; we all have populations more interested in PvE than WvW. Hollow words. Yak's Bend, for whatever reason, was able to motivate and mobilize its forces more effectively than SBI and that told and kept on telling. Told you I was Ash Legion. And so back to the Alliance. By mid-week that was very definitely A Thing. Tuesday and Wednesday evening it was still on the level of ad hoc, opportunistic timing of attacks, with YB and EB each paying attention to what the other was doing and changing plans accordingly, always with the joint intention of doing SBI harm. By the time I came home from work on Thursday, matters had progressed. At this stage Yak's Bend had built what was almost certainly an unassailable lead. There was no doubt but that we'd take first place in the match. That was when the focus shifted from the week to the Season. We lifted our heads and looked to the horizon and there we saw the glint of Silver. It wasn't enough just to win: we needed SBI to come third. There followed the most surprising and impressive segment of this already surprising and impressive match. For the best part of two full days, with no infrastructure provided within the game to foster cross-server alliances and no means whatsoever of enforcing them beyond encouragement, instruction and sheer peer pressure, Yak's Bend and Ehmry Bay managed to co-operate across four maps to work tirelessly and ceaselessly towards a single goal: keeping EBay's Points Per Tick far enough above SBI's to push them into second and keep them there. Yak's Bend High Level Strategy Meeting. It was hard work. SBI fought like cornered tigers on the field while their forum warriors and spies tried everything to undermine our resolve. When I went to bed on Thursday night, far too late, Stormbluff looked broken. At one point they owned nothing at all and their PPT was zero. Ehmry Bay had closed the gap by some seven thousand points with less than four thousand more needed to regain second place. I woke up expecting to see SBI firmly back in third. They were in second, nearly eight thousand points clear of EBay. Again. So many reasons why this rickety alliance should have shuddered apart. We'd won the match. We had the points. Ebay stood to gain nothing of practical value by soldiering on. There was only half a day left before reset. And still the alliance held. Non-aggression pacts continued to be honored. Commanders who didn't approve of the tactics nevertheless grudgingly agreed not to actively disrupt the efforts of those who did. Our goal and methods were explained over and over in map chat to make sure our pugs and militia understood both what was going on and why. Every effort was bent towards the single goal of coming out of the match with four points in hand over SBI not just two. If that meant giving EBay permanent residence in some of our homeland or knocking down keep doors then standing back and letting them claim the points and the possession then so be it. By all means necessary it would be done. And it was done. By the time I came home from work on Friday, Ehmry Bay were ahead of Stormbluff. Just. SBI never rolled over. Even when it was no longer even mathematically possible for them to recover second place (long after it had been obvious they would never make it) they were still fighting tooth and claw over their last tower. I stayed up for reset, something I haven't done since last year. When the end of match message flashed across the screen I felt an immense sense of satisfaction and pride in what we'd achieved. Not because of anything I'd done, although I put in a lot of hours and pulled my weight all week, but because of the way hundreds, thousands of people had been able to come together for a common goal and achieve it despite considerable practical and emotional obstacles in their way and because I'd been a small part of that. It's why we play massively multiple online games, isn't it? It seems a very long time ago indeed since we were all voting early and often for Evon Gnashblade or Ellen Kiel. Well, as we all know, Kiel won and yesterday she finally got around to fulfilling that election promise, the one about looking into the Thaumonova Reactor disaster. Things have been a tad busy on Yak's Bend this week and anyway it's fractals, so I haven't had a chance to investigate yet. Jeromai and Ravious have and they bring mixed reports. I think I might just read Dulfy and watch YouTube for this one. That wasn't here before. I'd have noticed. All very mysterious. Apparently there was something similar in GW1 and it spawned monsters or treasure or some such. All this one does is knock you backwards and tell you off. Color me intrigued. In not much more than a week, December 4th to be precise, should you be so minded you can start playing CoS: Arkadia, the new "English" version of the game formerly known as City of Steam. It was barely a month ago that I reported on the startling news that Mechanist Games had bought back the rights to their own game and closed the server down. They announced a plan to revamp and relaunch for the English-speaking market and look, here it is, back already. The official announcement emphasizes change. "Please don’t get the idea that the English version will be the same. It won’t", they assure us. It seems they got the message loud and clear: the highly-committed fanbase this game had built up before launch did not like the final version they were given nor the way it was run. Let's hope there are some fans still around and that they're willing to take another look. We're promised "a slew of new features such as Mercenaries, Alchemy, Fishing, etc, along with redesigned dungeons and improved gameplay". Given the excruciatingly long and painstaking testing process City of Steam "enjoyed" the first time around, this is an astonishing change of approach. No public testing at all - straight to Live. 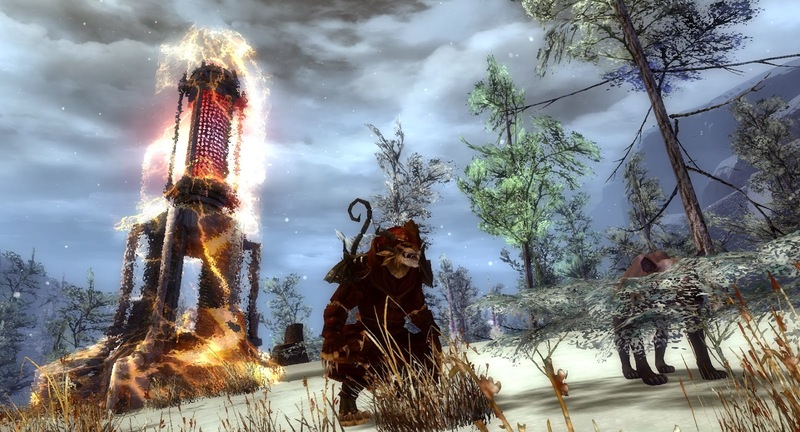 The inaugural GW2 WvW Season is drawing to a close. There's another match to come but as far as the North American Gold League goes we already know who's going to be king of the hill. Blackgate, sitting on 25 points from five straight wins, already lead by more than 50k points in this week's match, where they're playing the two weakest teams in their division, Maguuma and Sea of Sorrows. They face stronger opposition in the final week when they come up against second-placed Jade Quarry and current third-placed Sanctum of Rall but chances are Blackgate will finish with the maximum 35 points, Jade Quarry coming in as runners-up. Third place could go either to SoR or Tarnished Coast. 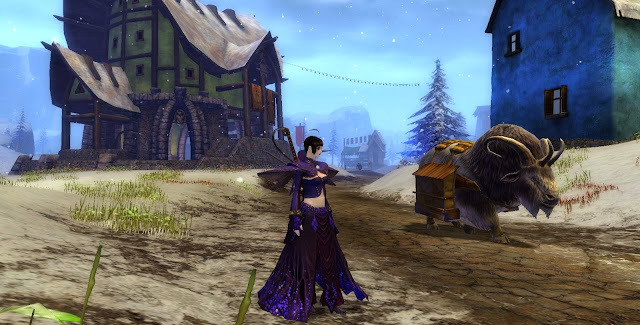 Gold League is somewhat different to Silver and Bronze and not only because it features some massively populated worlds with very intense, dedicated WvW players. There are only six teams in the Gold League; the other two have nine each. With more servers the differences in ability, commitment, population and effectiveness are necessarily wider between the top and bottom and also in a short seven-week season a degree of luck of the draw is unavoidable. Going into week six Silver League looks a lot more unpredictable, with just four points separating first and third place. As of last Friday's reset the smart money would probably have been on Fort Aspenwood to run out eventual winners with Stormbluff Isle a close second and Yak's Bend hanging on to third. The final week sees FA and SBI play each other for the second time with sixth-placed Dragonbrand taking collateral damage. Yak's Bend had a fortunate draw, playing Fort Aspenwood only once in the season, which might have helped our chance of nabbing third place, something most of the pre-season forum warriors thought beyond us. All the same, you can only play the hand you're dealt and even with the favorable draw, going into the penultimate match third place is by no means guaranteed. We have a tough match this week : Stormbluff Isle and Ehmry Bay. SBI trounced us in our previous meeting back in week three, romping home with a lead of almost 200k. Last week while we ran our wxp trains and enjoyed our 500 point ticks there was much wise counsel warning against complacency and emphasizing the difficult times to come. To hold on to our podium place we needed to come second this week then win the final round, a repeat of our opening match against Ehmry Bay (again!) and Borliss Pass. It's something a surprise, then, on this overcast November Sunday morning, to be sitting here looking at a scoreline that shows Yak's Bend not only more than 20k ahead of Stormbluff but SBI trailing third behind Ehmry Bay. Thus far this has been an amazing match. Not so much because of the score alone; Yak's Bend has a reputation for coming strong out of the gate at reset and burning hard across the weekend. We've had leads over strong opposition before but come Monday the real-life responsibilities of our largely working-age, gainfully-employed population take over and we fade a little. Well, so the story goes. Obviously I have no idea of the relative demography of our server or anyone else's but Yak's Bend has a narrative and that's part of it, along with our yak-like stubbornness and our obsession with siege engines. One of the things I most love about playing MMOs are the stories servers tell about themselves. 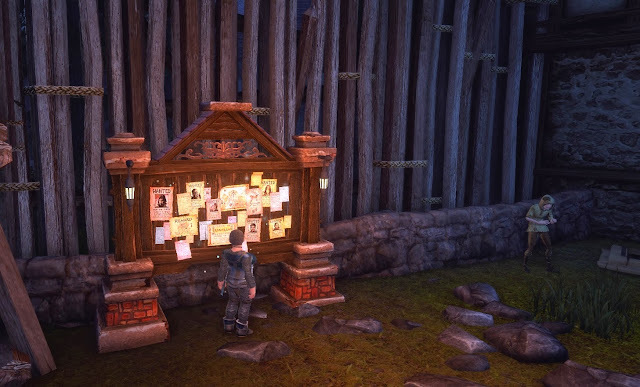 To me those stories can often feel more powerful in terms of immersion than the lore of the game itself. It's something Yak's Bend has in spades. This time it feels a bit different. SBI seem visibly weakened, their zergs smaller and more scattered, while there are more Yak boots on the ground than I can remember seeing for a long time. What's more, whereas last week our numbers were swelled by achievement-hunters joining the constant wxp trains farming easy targets and filling all the available channels with excitable chatter, last night map and team chat were consistently filled with good intel and tactical information and all activity was directed squarely at building a lead by taking territory and holding it. I spent the entire evening on our own borderland. Given the choice I much prefer to defend our lands rather than take other people's. I walked more dolyaks from supply camps to keeps in an evening than I normally do in a month, and I wasn't alone. No four-legged yak set out on his ponderous journey without several two-legged Yaks speeding him on his way, hiding him from approaching threats and defending him from would-be yak-murderers. Walking dolyaks is a vital but thankless task. The huge mobile haystacks set out from the various supply camps and stump along the frozen mud tracks to various keeps and towers delivering their mysterious "supply". Without this supply gates can't be reinforced nor walls fortified. Even when the walls and gates are as strong as they can be and the battlements bristle with cannons, maintaining a healthy level of "supply" inside the keep is essential for any protracted defense against a determined assault. If no-one walks with the yaks any passing enemy can pick them off at will. They don't defend themselves and the NPC guards that an upgraded camp provides do little more than slightly delay the inevitable. Dolyaks walk very slowly and accompanying one from camp to keep takes several minutes. A good thief, striking out of nowhere, can down one in a few seconds. Keeping one alive requires a skilled player capable of soloing all-comers or, more likely, a bunch of less-skilled players providing a visible deterrent. In my experience, walking a yak is either five minutes of tedious anxiety or a flurry of unexpected action followed by failure and sudden death. If the yak reaches the tower you get a small reward of xp and karma and the tower gets a small supply boost. Then you need to do it again. And again. And again. Unsurprisingly it's not the most popular of activities but last night there were, at times, more people willing to walk yaks than there were yaks that needed walking. I can't remember seeing that before. Our new-found willingness to buckle down and get on with the things that matter wasn't limited to the mundanities of animal-minding. At one point, out of the blue, one of the homeland Commanders issued a map call not for our own map but for us all to jump across to SBI's borderlands to defend the Hills keep that we'd taken, fortified and waypointed there. I went immediately. In seconds I was part of a large zerg, racing from our spawn to the icons of the two Commanders battling to hold back a large SBI force whose Omega Golems were already battering at the inner gates. By the time Mrs Bhagpuss tried to switch maps a minute or two later the map was queued. We successfully routed the "invaders" and chased them back to their Garrison, which we took later on that evening. I'm sure that kind of response is run-of -the mill in the higher tiers but it was new to me and quite thrilling. What's behind the upswing in interest and focus I couldn't say for sure. Certainly a lot of our regulars are out right now, which was less the case last week, but I can't help wondering if we haven't picked up a significant number of new converts to WvW as a result of the earlier achievement-focused activity. 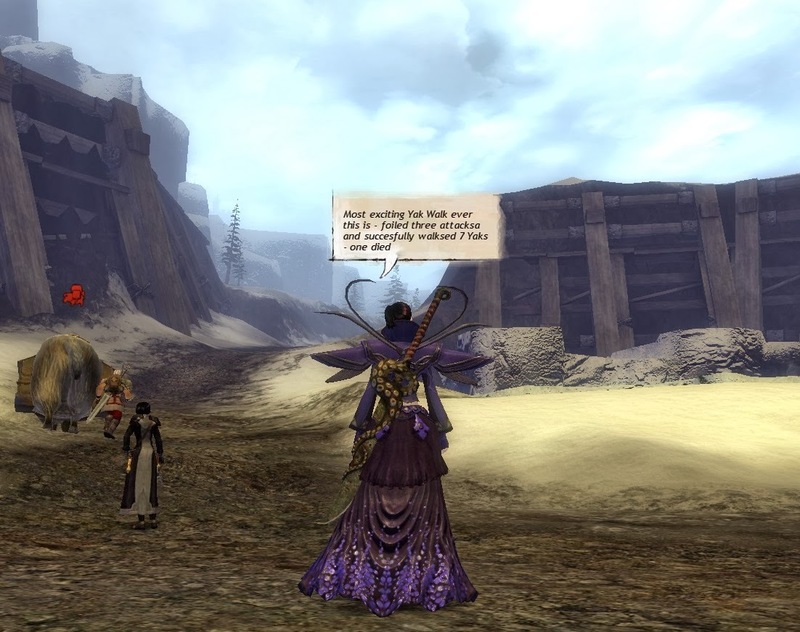 Did some of those players, new or newly-returned to WvW, get a taste for something more than uncontested door-knocking and decide to come and see what it was like when the other side hits back? Perhaps it has more to do with the nature of The Season itself. The end is in sight, we know what we have to do, there's honor and reward to be won and what's more there's the chance of pulling off a big surprise. I find it highly motivating. Maybe others do too. 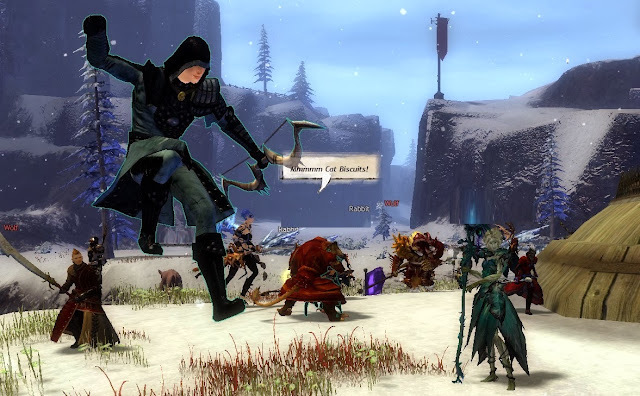 Whatever's going on, it makes for some of the most compelling WvW gameplay since launch. It looked a tough enough ask to hang on to third. Aiming for second is going to require everyone to step up. So, who cares who wins Gold in the Gold League? Silver in Silver, that's where it's at! And we can do it! We're Yaks! 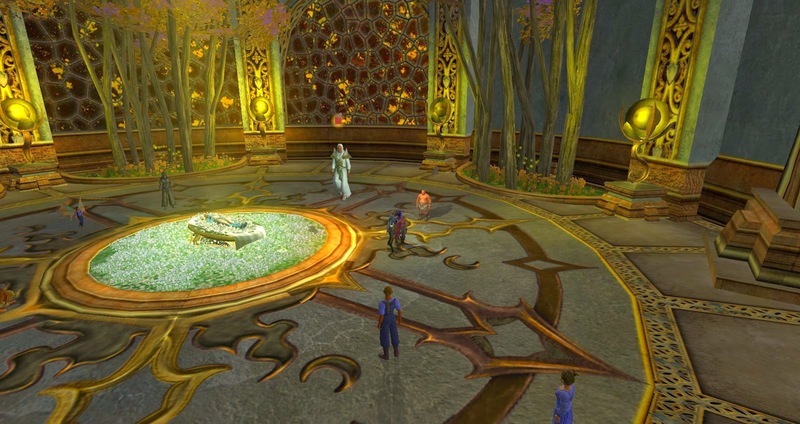 Tears of Veeshan, EQ2's tenth expansion, went live last week. 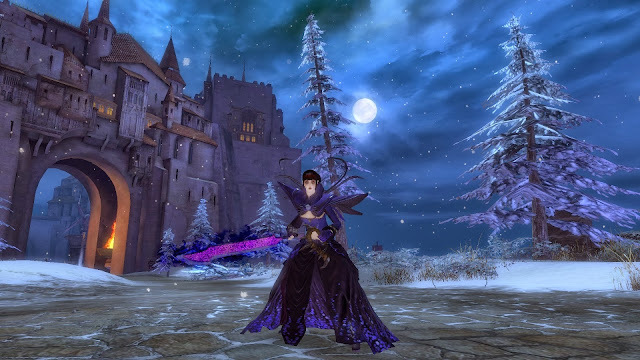 Not that I've seen anything of it, even though I've been playing quite a bit of EQ2 lately. I've mostly - well, entirely - been concentrating on the previous expansion, Chains of Eternity. We skipped that one when it released around this time last year but it comes bundled with the new one. Just as well because, as far as I understand it, all ToV content is aimed squarely at max level 95s and you need a bare minimum of CoE quest gear even to get started. 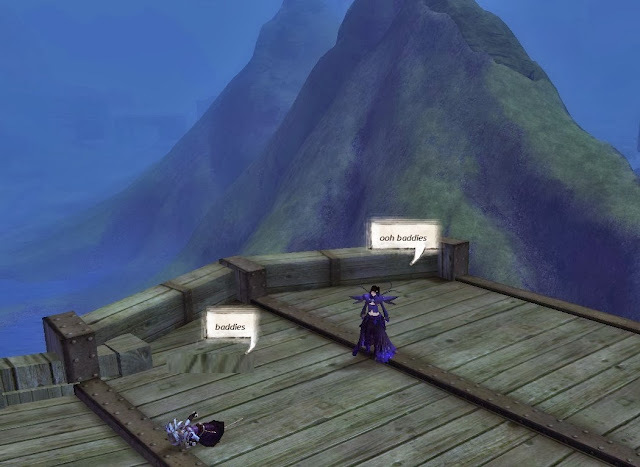 After all the recent hoohah about SOE selling or even giving away instant Level 85s, those who don't keep up with EQ2 may have gotten the impression that for a few dollars in Station Cash anyone can just bootstrap themselves to the top. Not so. Very, very much not so. 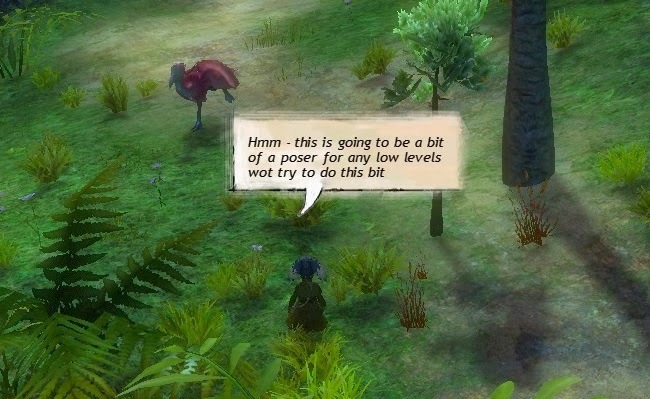 Leaving aside the unpleasant truth that in EQ2, as in many MMOs, the game a lot of people want to play could be said to start at max level rather than, as one might logically expect, end there, the issue of those ten levels remains. Going from 85 to 90 is, to use a technical term, a doddle. Ninety to ninety-five, on the other hand, is not. Now those'd fetch a bob or two down the pawnshop, right enough. When we pre-ordered Tears of Veeshan our accounts were immediately flagged for Chains of Eternity. I woke my ratonga Berserker from his year-long slumber, found my way to the Ethernere and began to work through the first of the two overland adventure zones, The Eidolon Jungle. On arrival he was level 92 and 320 AAs exactly. Six weeks on I have completed the entire signature quest line for the zone, along with a goodly number of side-quests and Advanced Solo dungeon instances in The Throne of Fear. I've continued the quest sequence through several more Advanced Solo dungeons - Sleeper's Tomb, Wurmbone Crag and Chelsith. Yesterday I finally returned to speak to Al'Kabor, the wizard who's dogged all our steps through a millennium or more of Norrathian lore and who now seems to have ascended to some form of godhood that requires us to address him as "The Duality". Yeah, right, Al baby. Like that's going to happen. I still remember the crappy spells you palmed off on aspiring wizards back in the old days so do me a favor with the airs and graces, why don't you? She's still dead then? I thought she might have got better. So, after completing more than half of the main questline in Chains of Eternity, where exactly do I stand vis a vis progress towards max level? Currently, at 92.6 and 321 AAs, that's where. At this rate, completing the entire solo quest content for the whole expansion should get me somewhere approaching the middle of level 93 and I might even have, oh, as many as 323 AAs! Not that I'm complaining. The questline has been entertaining, if slightly demented. I recently praised the Advanced Solo instances and they continue to be extremely well tuned. The rewards have been appropriate and satisfying. Every time I log in it feels like I'm making good progress. I'm still going to be the best part of two levels short of starting ToV content when I wrap this up, but there's a couple of major Velious updates I've never seen plus a deal of Heroic content I've never done that I should be able to handle in my spiffy new quest gear. Turn around. I need to re-program you. Yes, I do know what I'm doing! On that note, I had a wander through the Tower of Frozen Shadows the other evening, just me and Dok my trusty clockwork mercenary. That went well enough until I hit up against some Named that has a trick to him that requires two actual people. If I can just persuade Mrs Bhagpuss to stop defending the Honor of the Yak in WvW for half an evening I'm sure we could make it to the top. 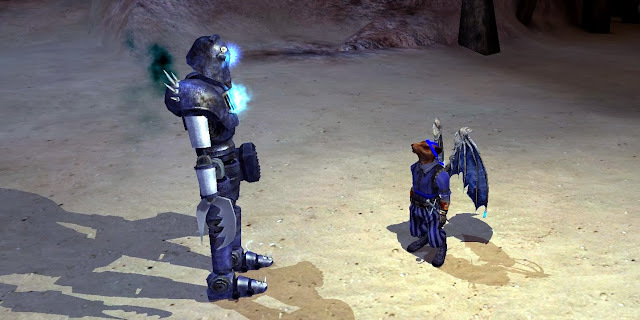 There is, though, an obvious drawback to EQ2's present predilection for combining ultra-slow leveling with a purely quest-driven approach: it's a lot of fun - once. Whether I'd want to do it a second time I'm not so sure. Of course, I have been doing this on my Silver account, where the experience slider is firmly set to a mandatory 50/50 share between Levels and AAs. Progress doesn't have to quite as glacial as I'm making out unless you positively insist on being a complete cheapskate. Going to need a really big frying pan. I have a level 92 Beastlord on my Gold account. He'd be able to set the slider for full leveling speed and I have vaults full of various xp boosters so there's potential to speed the whole process up considerably when his turn rolls around, but still the thought of wading through the same quests in the same sequence so soon afterwards does put me off a little. It's one thing doing the same quests but doing them in the exact same order is where I begin to balk. First time through, though, it's been a real pleasure, not least because some of the scenery is truly gorgeous. EQ2 is often, and often rightly, criticized for inconsistent and unappealing graphics but some of the dungeons are genuinely breathtaking. The sense of scale and depth just doesn't come across in screenshots, sadly. I spent ages trying to get some shots that did justice to the sheer. vertiginous, acrophobia-inducing cliff paths in Wurmbone Crag, for example, or the eerie, psychedelic vibe of Chelsith: The Ancient Vault. Largely without success,as you can see. Hmm. I recognize those trousers. 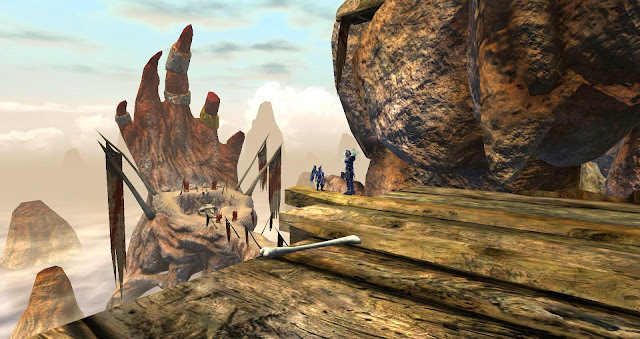 Far beyond the beauty of the views along the way, however, the entire journey from Firiona Vie's pantomime demise onwards was made worthwhile by the discovery of the Giant Ratmen Of Kunark. They're called the Ashlok and my ratonga had been fighting them for quite a while before he realized the four-meter tall monstrosities he was getting a crick in his neck from looking up at were barbaric versions of his own kith and kin. With the vile Roekilik and the pants-avoiding Chetari I make that four distinct rat races for Norrath but this latest one has a unique twist (as well as being the size of four or five ratongas standing on each others' shoulders, that is). The wiki tells us that the Ashlok "act differently during night and day". Enquiring ratonga minds must know! What do they get up to at night? If that's not worth running through the whole thing all over again then I don't know what is! Brell Serilis vs Jane Austen : Ever, Jane. It is a truth universally acknowledged that a game developer in possession of a good idea must be in want of a backer. Judy L Tyrer of 3 Turn Productions is such a developer. Her idea, and we must own it a good one, is to create an MMO founded on the published works of Jane Austen; most particularly, that is, upon the settings, customs, practices and characters therein. To this end she has begun a Kickstarter project in which she invites both Janeites and aficionados of roleplaying games alike to join with her in this noble enterprise. At present the sum raised stands at half that required with no more than a dozen days to go before foreclosure. The project is already further advanced than many we have seen. 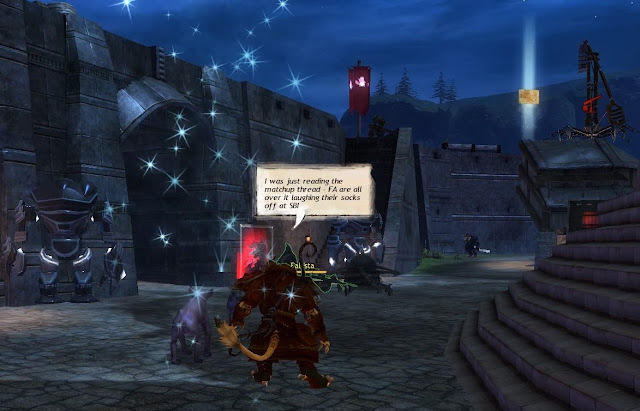 Prospective backers can experience a small taste of what lies ahead by downloading a working demonstration of the game, in which they may explore a small (very small) village, send invitations, buy lace and talk with other like-minded investors, should any such persons happen to be about the village at that time. It is a trouble very well worth taking to watch in full the promotional video that accompanies the appeal. Not only does this offer a glimpse of some of the very many wished-for activities that could not be included in the demonstration but also a charming explanation of the personal experiences that motivated Ms Tyrer's decision to embark upon so ambitious and, as it must be acknowledged, unusual a project. It seems that in choosing to bestow upon her enterprise its title "Ever, Jane", she has displayed a fine ability to make words do double duty, an ability that cannot but suggest a happy future for the depth and subtlety of wordplay yet to come, should the necessary funding be achieved. If you, dear reader, harbour any interest in the works of the sainted Jane or yet hold any lingering desire to play out a role, your time could be no better employed than giving consideration to this project : Ever, Jane. Watch yer backs, though. It's going to be PvP! Srsly! A very unusual match for Yak's Bend this week. We're playing the 8th and 9th placed servers in Silver League, Northern Shiverpeaks and Isle of Janthir respectively. We expected to win but the margin of victory has been a lot wider than I expected. At time of writing (10 am Tuesday morning) we have over 200,000 points, leading IoJ in second place by almost 140k. We've been ticking over 400 pretty much continually since the match started, frequently going for long periods over 500. I heard there was an hour or so when we actually ticked over 600, although it must have happened while I was asleep. 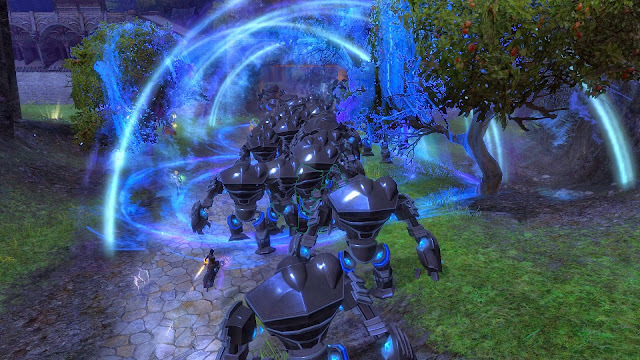 Back in March and April, when we met the zergforces that were Kaineng and Dragonbrand in their pomp, we were on the receiving end of this sort of thing quite often but I can't recall seeing it from the other side in quite this way before. 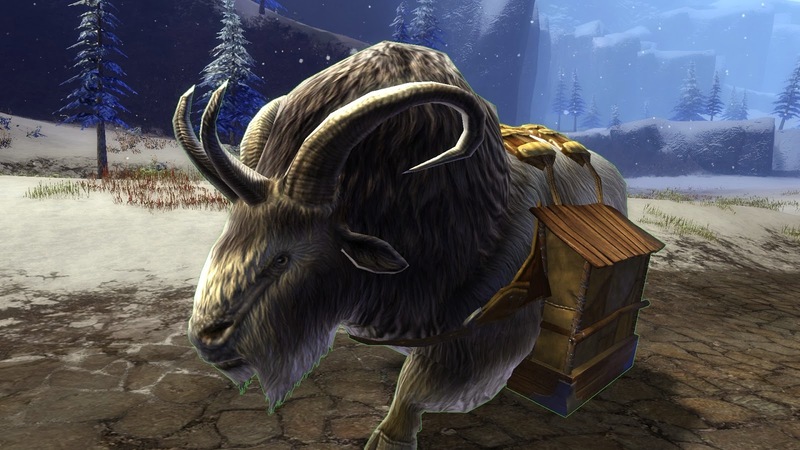 The strange thing is that with far less to play for than usual, this week's win being guaranteed, there appears to be more enthusiasm than ever for WvW and more Yaks on the field than ever before. It seems that far from wanting challenge and glory, a lot of people just like to get stuff done without those pesky other servers getting in the way. Both new and recently-added incentives are bringing a ton of unfamiliar names into The Mists, all with agendas of their own. Of course, most folks who are interested in ticking all the world exploration boxes finished up months ago, but there are still a few late-adopters and plain old lazybones, of whom I'm one. Despite hearing quite a lot of requests over the weekend along the lines of "Can we just take Veloka? 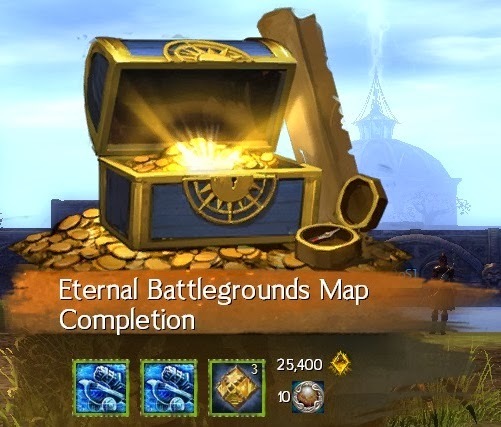 I need the vista for World Completion", I hadn't thought to look at my own progress until I logged into Eternal Battlegrounds a few minutes ago to take a screenshot for this post. Looking at the map I realized that although I was in the zerg that took both IoJ's and NSP's Overlook keeps yesterday I hadn't realized I had vistas still unchecked in each of them. Fortunately we still owned one and as I was hopping up the beams sticking out of the tower to reach the top a bunch of Omegas were already on the march to the other, so that's all sorted! World exploration may be old hat but the Season Achievements and WvW Ranks are still fresh and interest in those is keeping the trains running on time. I'm familiar with Karma/WXP trains running when we are losing badly - they're often employed as a motivator and morale booster when there's little or nothing more effective open to us. Massive trains running virtually 24/7 when we have the ability to take stuff anywhere at will is a new one on me, though. The Rank system appears to be the mechanism of desire here. One of our best and certainly most popular commanders commented in Map chat that he was hoping to use this week to get to Gold status before the next match. The lowest Gold title comes in at Rank 1395. (The highest possible rank, Diamond Legend, appears at Rank 9,945, or when hell freezes over, whichever comes first). By running trains non-stop he reckons to average 100 ranks a day. By the time I finished last night my Charr ranger, my primary WvW character although by no means my only one, stood at half-way through Rank 99. At 100 he moves on from being a General, a title I very much like, to become first a Veteran, then a Champion and finally a Legend. That all takes another fifty ranks until 150 when the clock gets rolled back and the entire sequence begins again from "Invader", only this time with "Bronze" stuck in front. I imagine I'll be long gone from GW2 before it becomes relevant, but in theory the entire process repeats five more times after that, going through Silver, Gold, Platinum and Mithril and ending at Diamond. As for the Season Meta, I'm very happy to confirm that I completed that at the weekend, on one account at least. Mrs Bhagpuss is one achievement short of completing it on both accounts but two is too much for me. It's a distracting complication in many ways. I did some things I would never otherwise have done at all, such as all the Jumping Puzzles, and quite a lot of things I might have done but not right now or not all at once, like standing on fifty ruins for 45 seconds at a time in a borderland we already own. The signs of these Achievements disrupting natural gameplay were everywhere; players draining vital supply to repair walls that were still being trebbed as they selfishly clocked up progress on Defense Restorer; players selfishly throwing down unnecessary ram blueprints hoping to get some hits towards Demolition Expert; players selfishly sitting on the circle at sentry points for Sentry Capturer Extraordinaire while map calls went unheeded. The difference this week is that whereas such behavior has previously been roundly condemned and peer group pressure has been employed to minimize it, in this match the general attitude towards the focus on individual rather than team goals has been much more laid back. All in all it's made for a relaxing change but I think most regulars would prefer a closer match. That said, we have still had some fantastic battles on occasion. We were blithely circling the Northern Shiverpeaks borderland last night, helping ourselves to whatever we fancied, when NSP brought a zerg in and wiped us at their Garrison. 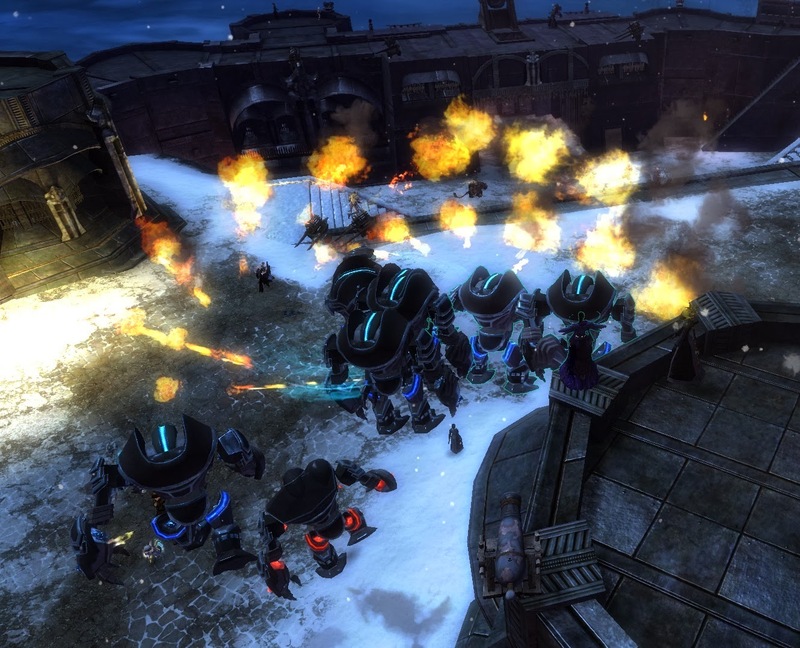 We promptly picked ourselves up, made a swarm of Omegas and marched them north for retribution. The second battle was intense but we emerged victorious. 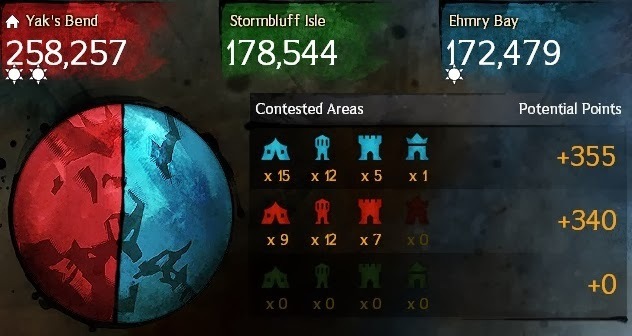 Later, the evening saw some ferocious fighting in Eternal Battlegrounds, with both Isle of Janthir and Northern Shiverpeaks fielding the largest numbers I've seen from them either in this or previous matches. There's intense competition between IoJ, who have come last in every previous match but who are currently in second place in this one and NSP, who stand to lose their place ahead of IoJ in the League if they can't overhaul IoJ's current 10k lead. The dynamic of this match may be unbalanced but so far at least it's never been dull. All the same, it'll be nice to get back to normality next week, when we face the steamroller that is Stormbluff Isle and our old frenemies Ehmry Bay. So. Trove. What the heck is that all about? 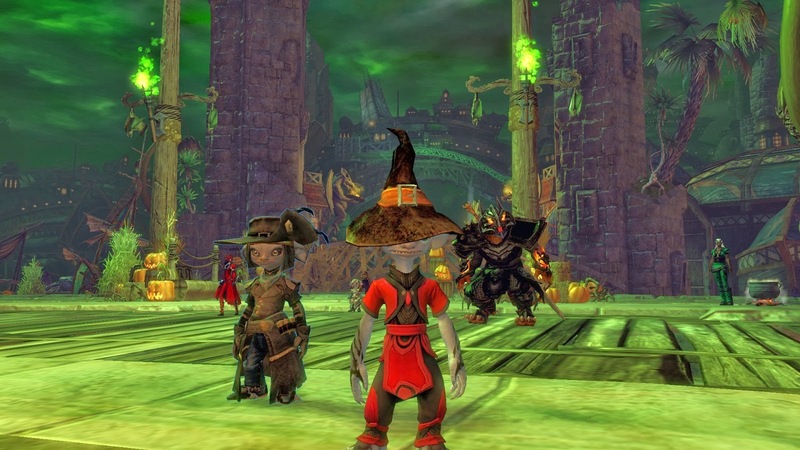 Is Trion setting out to steal a march on EQNext Landmark ? Did they look at what SOE were doing and think "Hey! 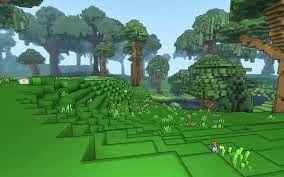 They missed a trick there - it doesn't look enough like Minecraft" ? 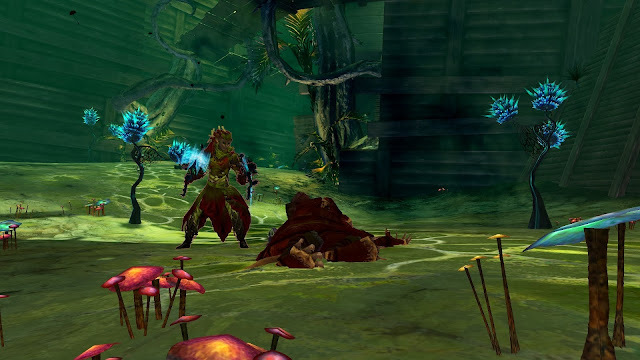 Maybe someone just saw GW2's Super Adventure Box side-project-that-grew and thought "I could do better than that". However the seed got planted something weird is growing. 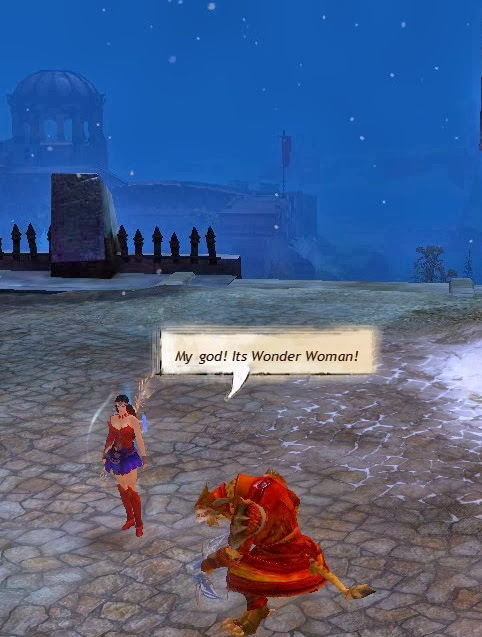 It seems the whole MMO genre is melting before our eyes right now. Someone crossed the streams and we're all caught in the feedback. I was already struggling to understand Landmark although the recent hour-long Livestream did clarify some things. Off-puttingly, unfortunately. Only one race and it's Human? Bleh. Hunting creatures for resources not in until after launch? Pshaw! Most of my questions remain unanswered but still, Landmark starts to look almost conventional compared to Trove, a game which I am not even going to attempt to parse at this stage. There's clearly a trend developing and I'm not at all clear on how I feel about it. For years big and small game developers alike churned out quest-driven theme-park WoW clones seemingly by the dozen. There followed a brief and heady rush of games supposedly driven by Dynamic Events. It was frustrating at times, exciting at others but I always felt I at least knew where I was. Seemingly overnight that's all changed. The biggest and almost certainly the most far-reaching development is the sudden willingness of games companies of all sizes to go full-bore into Build Mode. If that just meant a corporate landgrab for the huge audience of would-be world-builders that Notch uncovered that would be one thing; a sideways slide from Theme Park to Sandbox is never more than a swing of the pendulum away for the genre in any case. It's not just about the building you do inside the MMO, though. The current wave of MMO developers all seem to have undergone some kind of mass conversion to collectivism. Having decided their customers would all rather be building castles than delving in dungeons they've extrapolated from the micro to the macro and decided to contract out the entire job to us. Don't just build stuff in the MMO. Build the whole damn thing! At one point in the Trove video a Trion dev says "We have no ego". They'll take ideas from anyone. They're not proud. Scott Hartsman pops up to tell us about the "magic" that happens "when developers and players are interacting". Like Terry Michaels and Dave Georgeson over at Sony Towers the Trion Team believes it's never too early to get players involved. Your Game Developer Needs You! Go sign up right now. Oh, if only those ancient Greeks had come up with a letter before Alpha we could get in there even sooner! Before the majors jumped this train it was already steaming down the track that Kickstarter built. Let's just hope there's no washed-out bridge waiting somewhere down the line. Ah, but those arguments over the whole crowdfunding concept are well-rehearsed. We're all just waiting now to see how things turn out. And this is where we get to the crux of it, for me at least: time. It's true I'm not sold on the whole "wisdom of crowds" thing. Like Wilhelm I find Dave Georgeson's acknowledgement that "Sometimes we ask questions that we know can only go one way." reassuring. Maybe it's the Everquest in me; I prefer my developers to have Vision, with or without the trademark. It's also true that I'm aware of the potential issues with fair reward and exploitation that could arise from some of these crowd-sourcing systems. Those aren't the aspects of the current direction of travel that are making me feel increasingly wary and uncertain. No, it's more that I'm by no means sure that where we're heading is somewhere I want to go. A decade and a half back I came on board for an experience that amounted to a fantasy roleplaying game equivalent of Nathan Detroit's oldest established permanent floating crap game. The venue and the house rules might change but somewhere, day or night, you could be sure there'd always be a party LF1M. Now, I purely love housing in MMOs. I think some form of housing should be in every game. There's little I like better than ending a session by putting down a few trophies, /sitting by a cosy hearth and logging out. I like crafting things for my house, farming mats, being given furniture by grateful NPCs for whom I've done some small service. Carrying a dining table out of a forest may not be high adventure but it certainly is roleplay, and I do still believe these are at heart roleplaying games. I'm not even entirely averse to a little tinkering around behind the scenes. I enjoyed EQ2's Dungeon Maker for what it was, which wasn't all that much in the end, and for a while I entertained fantasies of telling a few tales with Neverwinter's Foundry. The reason those fantasies never took form is because of a little epiphany I had a while back: I want to play MMOs not make them. Building art assets, constructing scenery, writing and plotting scenarios - even with the whizziest, most user-friendly, intuitive tool-set imaginable it takes time. A lot of time. 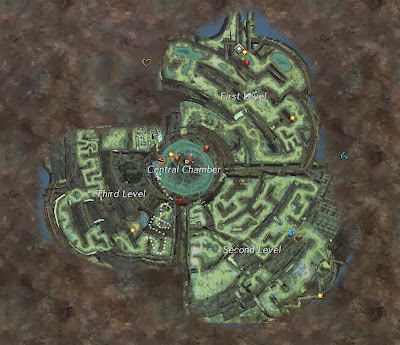 It took me many weeks working many hours a day to complete one Neverwinter Nights scenario. Back in the 1980s it took me almost as long to finish a text adventure using The Quill. These projects were highly engaging, deeply involving and ultimately very satisfying but they were also exhausting and incredibly time-consuming. The more I think about it, the less I want to repeat that process. I'm in my mid-50s. I no longer see an endless corridor of years receding away from me to an invisible vanishing point. The prospect of spending hundreds of hours working on virtual vanity projects no longer appeals the way it once did. As for being paid for my efforts, as the Player Studio offers to do, a model which, if successful, will no doubt be emulated widely, well I already have one badly-paying job; I don't need another. None of which is meant to suggest that I'm not interested in dabbling in such things, in short bursts, now and again, as long as it's amusing. I get creative urges. Often. The thing is, I already have an outlet for those: this blog, which eats up enough and sometimes too much of my play time already. So it's fair to say that I'm wary of the way things seem to be going. There's a push towards open-ended, user-generated content and collaborative development from one side and signs of a pulling away from directed, level-based content on the other. And yes, the recent flurry of schemes to skip over levels to get to the end game is another part of the ongoing dismantlement of the traditional MMO. 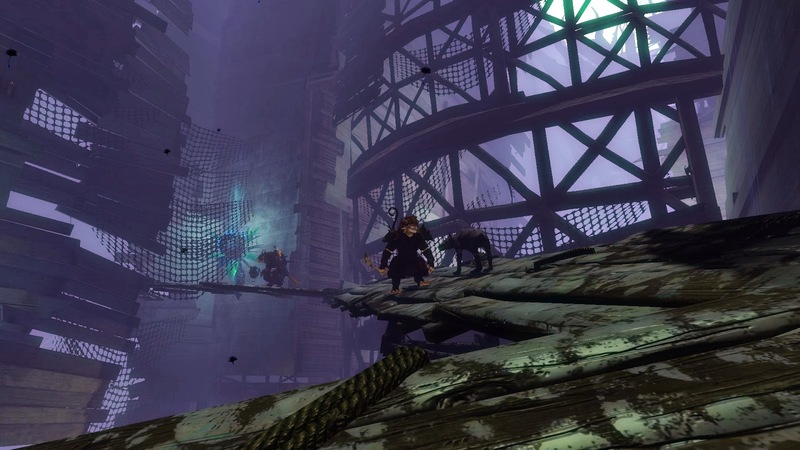 Ravious and Zubon have both posted about the relatively tough times they had in their first runs through the Tower That Krait Built in the new Living Story update for GW2. Interesting how experiences vary. I went in as a ranger wearing my usual Carrion Undead, which is all Toughness, Vitality and Condition Damage. I had no idea what was in there or how anything worked. Ended up in Overflow, reasonably busy, not packed. After a quick look around I followed a zerg which ran straight to the first instance (or an instance anyway) and stopped. I waited and nothing happened so I went into the instance, expecting to find myself alone in something designed for a group. 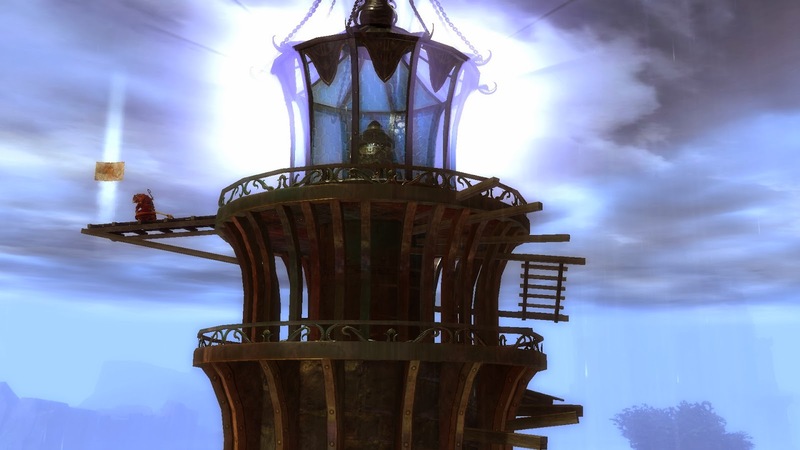 After a while I found myself on the second floor where I opened one of the travel golems that let you move around inside the tower. 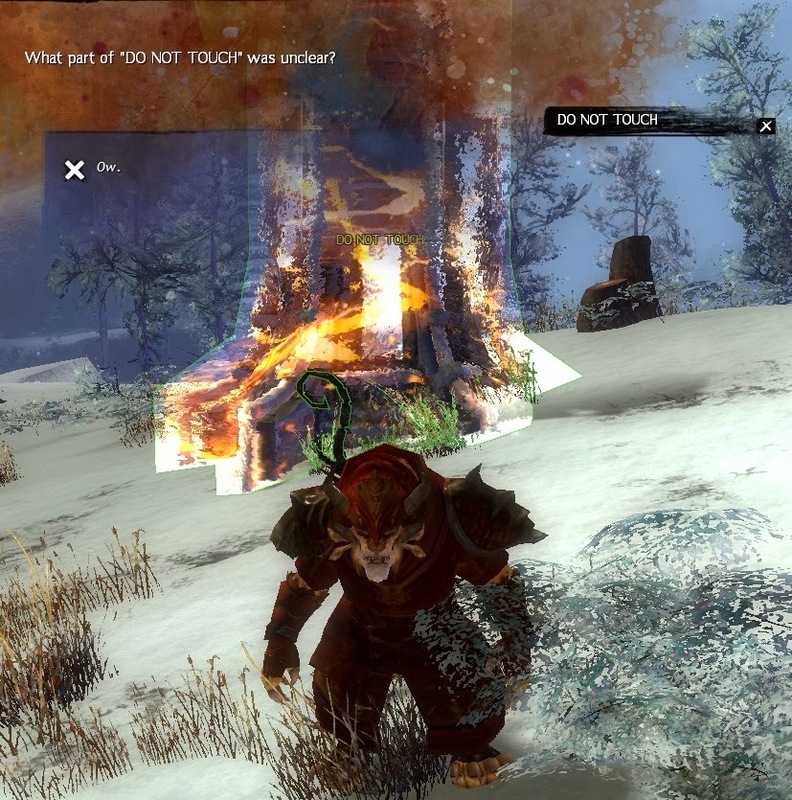 I ignored the warning of the wounded Asura on the floor and headed into the spider area. I got webbed soon enough but it didn't seem all that difficult. As I was grinding through the spiders a few more people drifted up. We had maybe five or six by the time we got to the far side, where a Champion Spider Queen was waiting. We got her down without much difficulty. By the time she died I guess there were a dozen people there. They all ran off and I got lost following them and ended up on my own again so I looked at the map for the first time. Using that I worked my way alone to the third floor, opened another golem for travel and went into the next instance. It was much the same as the first, except with a different mini-boss at the end. The first one was so nondescript I didn't even realize he was a mini-boss. This one jumped around like a flea on a flat iron, which was more annoying than dangerous. I killed him, freed the prisoners and that was that. I came back out and did some more exploring, trying to work my way up to what looked like the top where there seemed to be some kind of portal or entrance. It did eventually get too tough and I finally died about five paces from whatever the thing was that I was heading for. After that I waypointed back and wandered about for a while, jumped off into the water in the middle and explored the underwater area (nothing there I could find) and after maybe an hour and a half in total realized I was somewhat bored, a very unusual sensation. There's really not very much to do in there, is there? 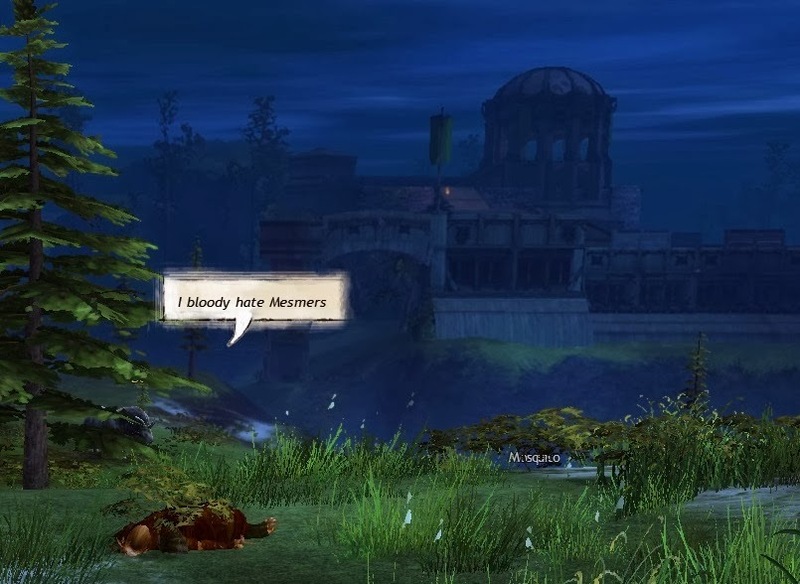 I left and went to WvW where I had a massively more enjoyable time and I haven't been back since. Unless there's something to it that I've missed I'll probably skip this update and concentrate on the Season. I didn't look at the rewards for the Achievements or the Meta but unless they're very special indeed I predict the tower will be virtually empty for most of the two weeks. It seems like a lot of work for not very much and amazingly designed though it is, there's only so much entertainment to be had from looking at a lot of dripping wet planks. I did find a lot of the dialog amusing and there are some interesting hints toward something that might almost pass for a plot. Some of the voice acting is really quite good, too. I'll probably make the effort to finish the story instances just to hear the conversations. Other than that I'll probably give this one a pass. 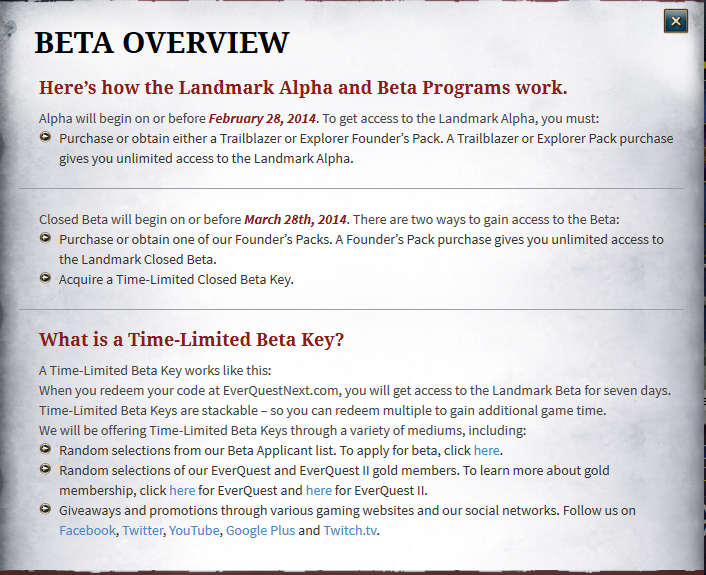 Details of the Alpha and Beta programs for Everquest Landmark have just been announced. They may not be quite what you were expecting. Even though they began to take beta sign-ups months ago, rather than go with any kind of traditional closed beta that ramps up over time or for a modish series of beta weekends, SOE have gone full-bore for the classic pay-to-play option so beloved by F2P publishers the world over. In short, there are three nested options, the more expensive containing all of the more inexpensive. 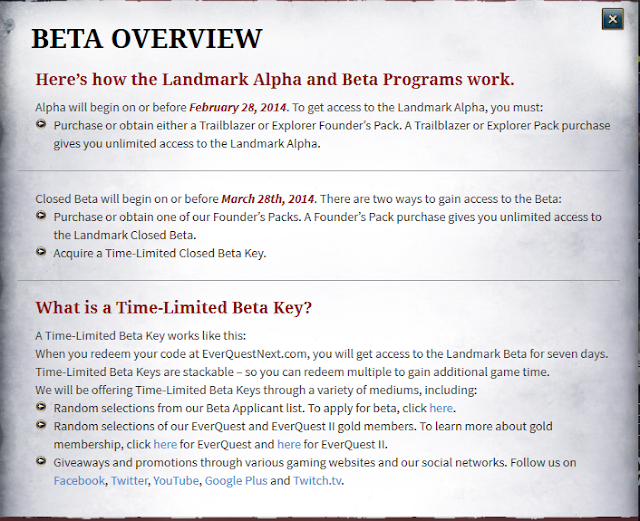 The Settler Pack costs $19.99 and grants you guaranteed, unlimited access to "Closed" Beta which will begin on or before 31 March 2014. 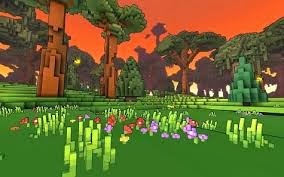 The Explorer Pack costs $59.99 for which you are guaranteed unlimited access to both the beta and the preceding Closed Alpha, which will start on or before February 28 2014. The Trailblazer Pack weighs in at $99.99, bagging you exactly the same access rights as the Explorer, plus four time-limited (one week) Beta keys to hand out to lesser mortals your friends. 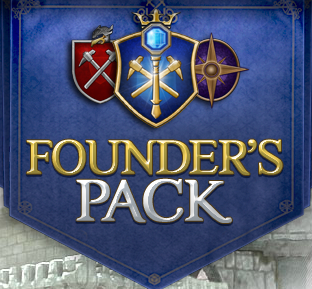 All three packs, of course, come with a range of in-game items, Titles and other perks. I'm in several minds about all this. I don't have any particular objection to the concept of paid betas and the terms "alpha" and "beta" have long since lost their value in this context so that doesn't really come into it. Moreover, some of the items included do look genuinely useful, the kind of thing you might well choose to buy from the Cash Shop - extra bank space, bonuses to gathering and the like. Added to that, it's a game I will certainly be playing and which I would certainly have bought had it been offered as a box or Digital Download at the same price. Those are all good reasons to pony up. On the other hand, there's the nature of the game to consider. It's a building game, primarily. I'm not even sure I'd want to spend much time in the Alpha or Beta of a game based around building structures, all the while knowing that any structures I build are themselves, in SOE's words, "Time-Limited". It's one thing to run around in a beta killing monsters and reporting bugs but entirely another to spend large amounts of time and creative energy on building something that will return to the void in a matter of weeks. And then on the gripping hand, as Larry Niven or Zubon might say, there's the whole "help build Everquest Next" thing. Some people have already expressed considerable suspicion about the entire concept of players making items in their own time on behalf of a large commercial company that might or might not reimburse them for their trouble. Now we have moved into the area of players paying a huge corporate entity for the privilege not only of testing its current product but of supplying intellectual property for its next one, too. It bears some thinking about. I'm not rushing to get my credit card out just yet. I'd like to see a bit more about just how persistent the progress we make in Alpha and Beta might be, for a start. And when the finished game might actually launch. February and March, though, are very good times for me and gaming. I always have a lot of holiday to use up around then. And that Explorer Pack does look rather nice. Jeromai had some very interesting things to say about the current World vs World Season, tying neatly into the ongoing debate on Achievements. While I was reading it occurred to me that one of the foundations of the whole discourse might be developing a slight wobble, namely The Bartle Test. We all know the provenance of this, I'm sure. Anyone who doesn't can get up to speed in a minute or two at Wikipedia. We all quote the Archetypes and our own four-letter formula and score whenever it seems relevant. What I don't know and have never really even thought about before today is whether it still merits the attention we give it almost twenty years on. Richard Bartle posited the four archetypes, Explorer, Achiever, Socializer, Killer back in 1996 and we've all just gone along with them ever since. Do we really think those are the only four motivations driving players? 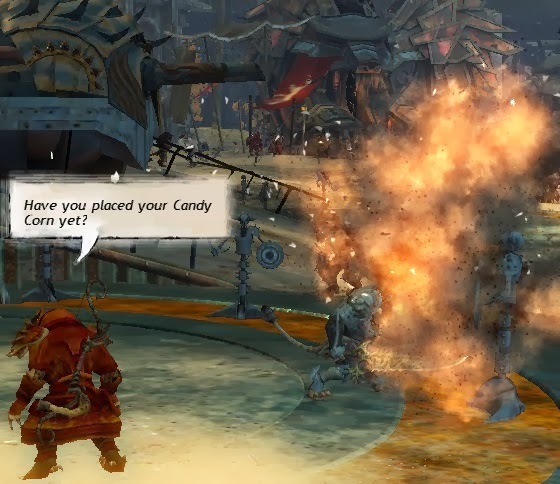 Are they sufficient to explain all player behaviors in all MMOs over the last two decades? Do they accurately, sufficiently and exhaustively describe the entire and full range of psychological factors that drive every individual to play and to keep playing these games? Doctor Bartle didn't pluck the archetypes out of the air. As he says in the preamble to the very readable, chatty paper that started all this, they were condensed from the comments of several hundred posts on a bulletin board belonging to a MUD, a lengthy conversation to which some thirty people in total contributed, the bulk of the comments being made by half that number. The four archetypes having been distilled from this boiling pot of argument, some time later two entirely different individuals developed the Test we all know and which we take and retake just in case we might have had some kind of personality change since the last time we tried it. The test itself reminds me of nothing so much as those "Is He Really Right For You?" quizzes so popular in teenage magazines of the 1970s and 80s, in which you would frequently end up checking a box against something you would never in a million years say or do simply because the other options seemed even less plausible. Whether there is any scientific validity in this methodology per se I have no idea. To what degree this kind of psychometric testing, if that's indeed the category under which it falls, can be considered to be part of the Scientific Method, I couldn't say. If there's any kind of recognized peer review process for this sort of thing (if there even is a "thing" for this to be a sort of) I wouldn't know. Either which way, it seems odd that one man's summary of fifteen people having a heated discussion on a MUD bulletin board almost twenty years ago (with another fifteen kibbitzing and chiming in from the sidelines) should have come to form the basis of design decisions for an entire genre of entertainment that didn't even exist at the time the discussion took place. I never played MUDs, having graduated University in 1981 and having anyway read English, meaning I never even saw a computer let alone used one. 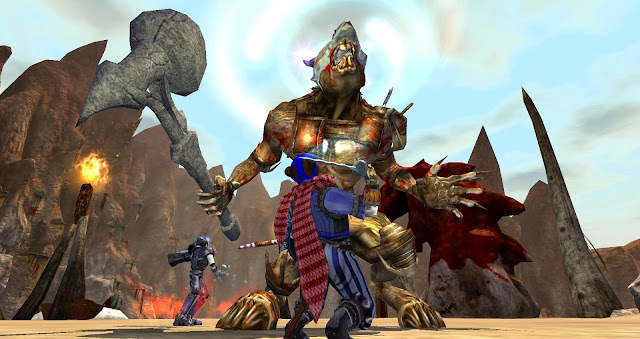 It was a little after Richard Bartle wrote his first paper that I got my first home dial-up and by the time I was ready to consider using it to play games online Everquest had been out for over six months. Consequently I can't say from personal experience whether the Bartle Archetypes accurately represent the full range of activities available to MUD players. I would contend, though, that even if they did they fall some way short of describing the options available to players of modern MMOs. It's true that one can almost always collate any number of human activities under larger and larger catch-alls so no doubt an argument can be made that KASE covers all bases, but I wonder if such reductio ad absurdum methodology really gets us all that far? When I spend four hours on a Sunday morning sorting my banks, something I've been doing for many years, which archetype is that, precisely? When I do my dailies with no intention whatsoever of using any or the rewards but just because they make for a pleasant, soothing, familiar routine that relaxes me when I get home from work, where does that fit? 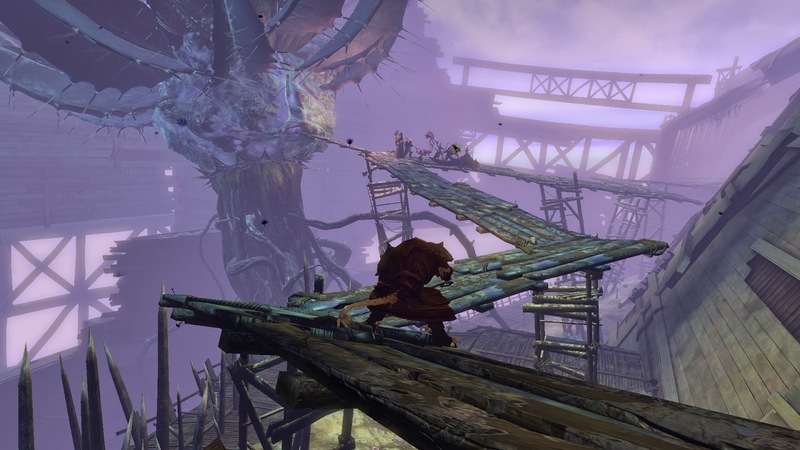 When I swing the camera about while I run up and down the ramps in Black Citadel as a Charr for the umpteenth time, imagining I'm really a giant cat, what am I exploring, achieving, or killing? I know I can't be socializing because there's no-one there but me and isn't that another thing that's changed out of recognition since the MUD days? 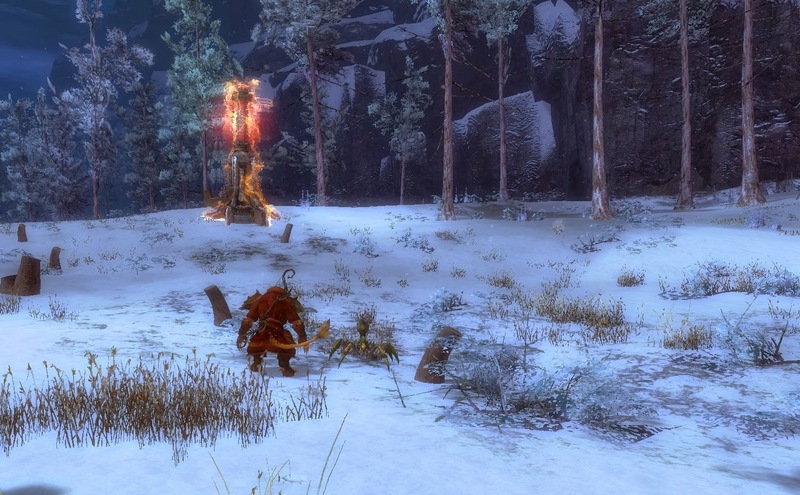 So much of one's time in a modern MMO can be spent entirely alone, and amusingly so. If I spend a week moving the furniture around in a virtual house that no-one but I will ever see, or working nostalgically through quests I've done a dozen times before, this time on a character that I know will soon be sent back into the limbo of character select, half-forgotten, rarely if ever to be called upon again, which archetype am I fulfilling? In spending hour after hour concentrating on visual images while playing alone, am I even playing in the same ontological space as that inhabited by the text-adventuring, community-oriented participants of that seminal bulletin board discussion all those years ago? Next year we expect to see the launch of a multi-million dollar, triple-A MMORPG overtly and proudly based on Archetypes : WildStar. Carbine stuck with four but kept just one of the names; Explorer. The other three they changed to Soldier, Settler and Scientist. Whether it's a nomenclature that represents the behavior of the current wave of MMO players more accurately than Bartle's established quartet we will find out in due course. I rather doubt it. The more I think about the whole thing, the less I feel represented by any of the terms in play, old or new. Where's Potterer or Observer? What about Collector or Organiser? Photographer or Sightseer? If we can, as is entirely possible in many MMOs nowadays, play for hours, days, even weeks without exploring anywhere, achieving anything, killing anyone or communicating with another human being, and yet still have a really fun time doing it, mightn't it be time to lay the old archetypes to rest? Or at least come up with some new ones?